In August, I posted a recipe for Peach Cobbler. It was based on a recipe card that my mother had on file for many years. I shared it with you because the recipe always yielded a good cobbler. However, soon after publishing the recipe, I realized that the recipe was not completely a Delicious Discovery. I thought the method was too fussy for a cobbler and I thought it could use a little more dough on top. So, for about a month, I’ve been working on the Peach Cobbler and have updated the August 24th, 2010 post with my own recipe. Peaches still abound in the market, so try my recipe for a not-too-sweet Peach Cobbler with warm, soft fruit and a crunchy topping. Last week, I picked up a recipe for Fresh Gazpacho Salsa Dressing at my CSA distribution site. It’s a great way to put the many tomatoes I am getting from the farm to use. I made a few changes to the recipe to suit my family’s needs and taste. However, you may want to use the 1 green chili pepper and freshly ground black pepper that I omitted. 1. Combine all of the ingredients in a blender or food processor and pulse until smooth. 2. Use immediately or store tightly covered in the fridge. Use within 3 days. The recipe suggests using the dressing in a salad with any combination of the following: roasted corn, black beans, chickpeas, lettuce, spinach, hearts of palm, marinated artichokes, etc. I used it as a marinade and sauce for baked salmon. 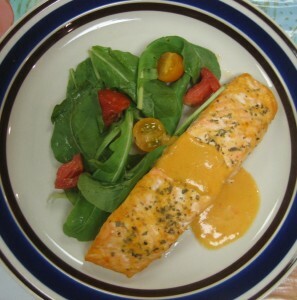 The dressing imparted a pleasant sweetness to the fish, which my family and I throughly enjoyed. Life without figs would be heartbreaking. 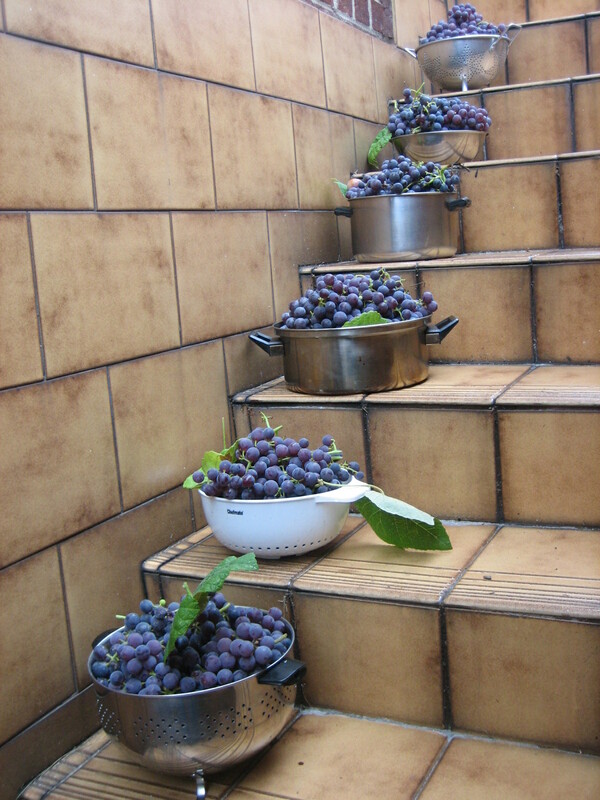 I’ve been eating fresh figs at the end of each summer for as long as I can remember. After all these years, I’ve become well acquainted with the two types of figs in my garden. 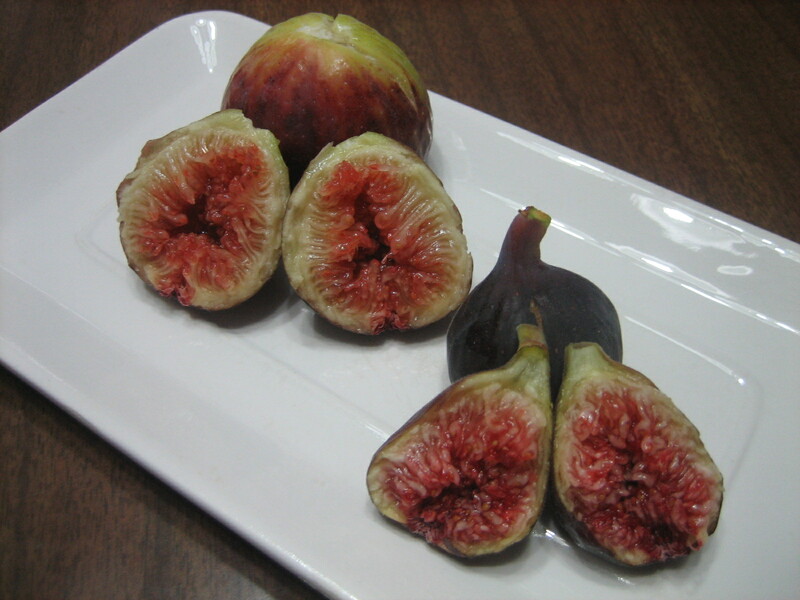 The fig on the left has a mellow, honey flavor, while the one on the right has a delightfully intense sweetness . There are so many other varieties of figs, each with their own distinct taste, color, and shape. 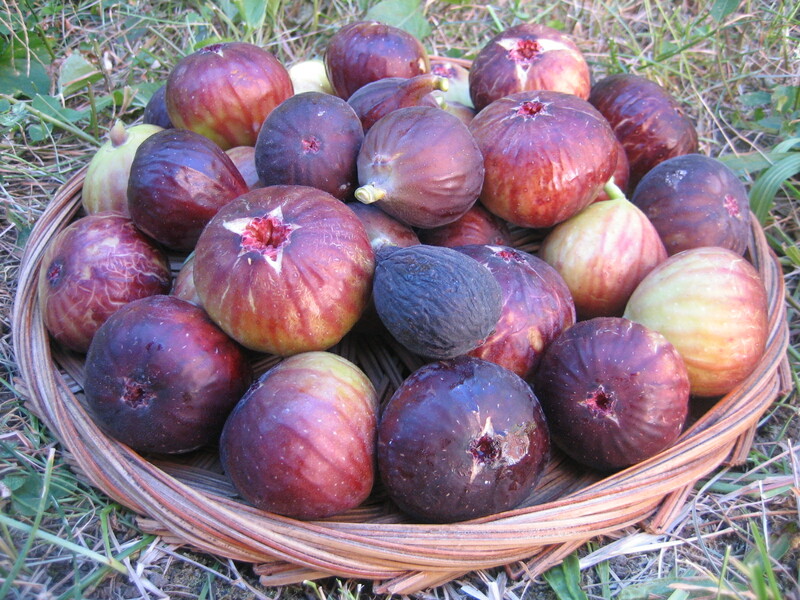 Do you share my love for figs? 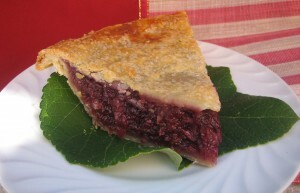 Two summers ago was the first time I baked and tasted grape pie. 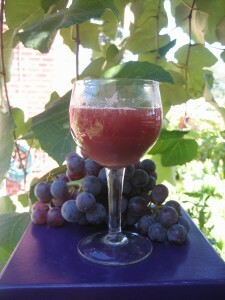 I followed a recipe in the Sept. 2008 issue of Bonappetit to make use of the Concord grapes that grow in my backyard. 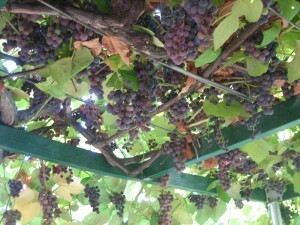 I’m lucky to have my own supply of Concord grapes, since they aren’t so popular in supermarkets. The pie recipe I use calls for seedless red grapes, but I suggest that you use Concord grapes. I’ve spotted them in more markets lately. I don’t want you to miss out on the amazing pie and the juice strained from the Concord grapes during the pie prep. The taste of fresh, unfiltered Concord grape juice is nothing like grape juice from a bottle. It’s hard to describe, but my sister calls it “nature’s candy”. Note: I cool the grape pie for at least 1.5 hours before serving. On a hot summer day, it’s nice to keep the oven off and to eat food that’s light, fresh, and maybe vegetarian. 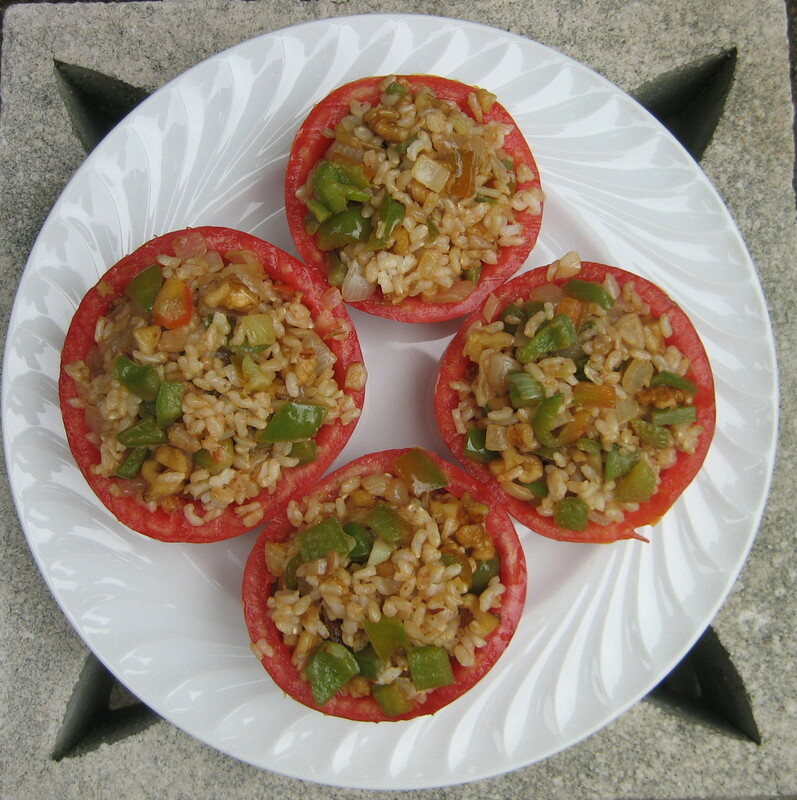 The flavor of these tomatoes stuffed with brown rice and walnuts remind me of stuffed bell peppers, because the main ingredients used are similar minus the ground meat. If you prefer, substitute cooked ground beef for the walnuts. 1. Slice each tomato in half horizontally. Remove and discard the seeds. Run a knife around the inner edge of each tomato, leaving a wall thick enough to support the filling. 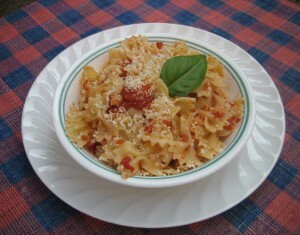 Then, scoop out the pulp/juice and reserve it to make Quick Fresh Tomato Sauce (recipe below). Invert the tomatoes to drain any excess juice. 2. In a small bowl, mix the salt, paprika, onion powder, and garlic powder. 3. In a large skillet, heat olive oil over medium heat. Sauté onions for 1 minute. Add garlic and pepper and cook for 3 minutes. Stir in walnuts and cook for 1 minute. Mix in the rice and ¾ tsp. of salt blend. Then, sprinkle ¼ tsp. 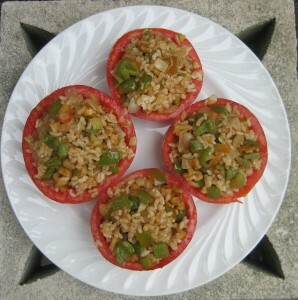 of salt blend over the hollowed-out tomato halves and fill them with the brown rice mixture. I strongly suggest that you use brown rice in this recipe because it imparts a nuttier flavor than white rice. Also, brown rice is healthier than white rice because it’s high in fiber. Remember, fiber keeps you full for a longer time, helps your digestive system run more smoothly, and has been associated with a lower risk of metabolic syndrome, diabetes, and cardiovascular disease. A few years ago, I was hesitant to incorporate brown rice into my diet because I didn’t think I would like the taste or the texture. However, I decided to try brown Jasmine rice (from Trader Joe’s) because white Jasmine rice was the staple in my home. I liked it, so I started to sample other kinds of brown rice and discovered that I enjoyed Nishiki medium grain brown rice the most because it’s moister than others. Explore the many brown rice choices you have in your supermarket and I’m sure you’ll find the type of brown rice that is perfect for you. Homemade tomato sauce is easy to make, tastes better than store-bought, and is often healthier than pre-made sauce because it contains less salt. In the following recipe, the amount of salt used to season the sauce is up to you. A couple of pinches should do the trick. The same is true for the addition of sugar. As a Sicilian, sauce is not sauce unless it has some sugar in it! In a medium saucepan, heat olive oil over medium heat. Add garlic and cook for 1 minute. Carefully pour in the tomatoes and add the basil leaves. Bring to a simmer and cook for 18 minutes, until much of the juice has evaporated. Stir in the red wine and cook for 5 minutes, stirring occasionally, until the sauce has thickened. Discard the garlic and season with salt and sugar to taste. Toss with pasta and serve.